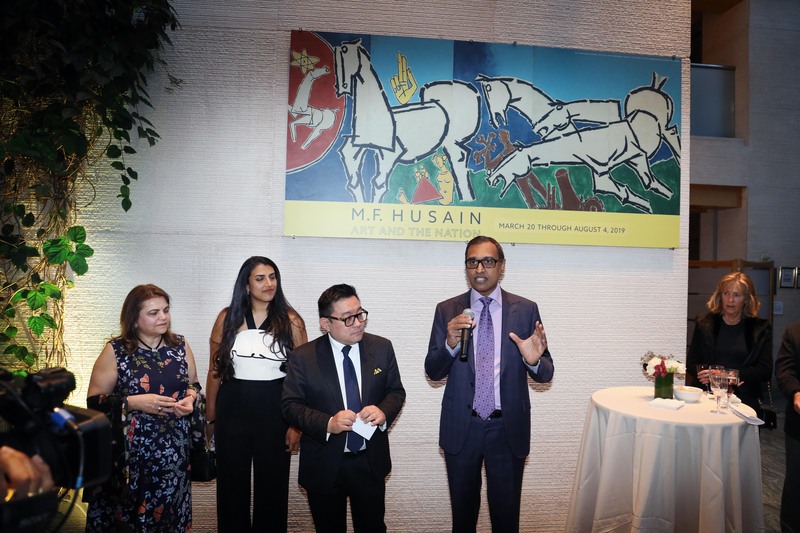 Indian American entrepreneur and art collector Kent Charugundla speaking at the reception of the exhibition of ‘Lightning’ by M F Husain, at the Asia Society, in New York, on March 19, 2019. His wife, Marguerite Charugundla is on the far left. Photo: Mohammed Jaffer-SnapsIndia. NEW YORK – Kent Charugundla is the holder of one of, if not the largest, India art collections in the world. He sponsored and co-funded several art exhibitions in New York area including but not limited to Gaitonde at Guggenheim, NY, and Peggy Guggenheim of Venice, Italy, NYU, Queens Museum, sponsored and underwrote the cost for “India Now” at MoMA, and has sponsored many other art and photography exhibitions. Charugundla is the Chairman & Managing Member of Empire Ventures, LLC., an Advisory Board member of SXSW, a Board member of OrecX and a Global Arts Council member at Asia Society Museum, NY. He has established educational partnerships with colleges and universities across the country, including West Virginia Wesleyan College. He was awarded the Life Time Achievement Award for Telecommunications in 2005 and has received more than 20 awards from industry peers and publications for service, innovation, product, and best of best awards. 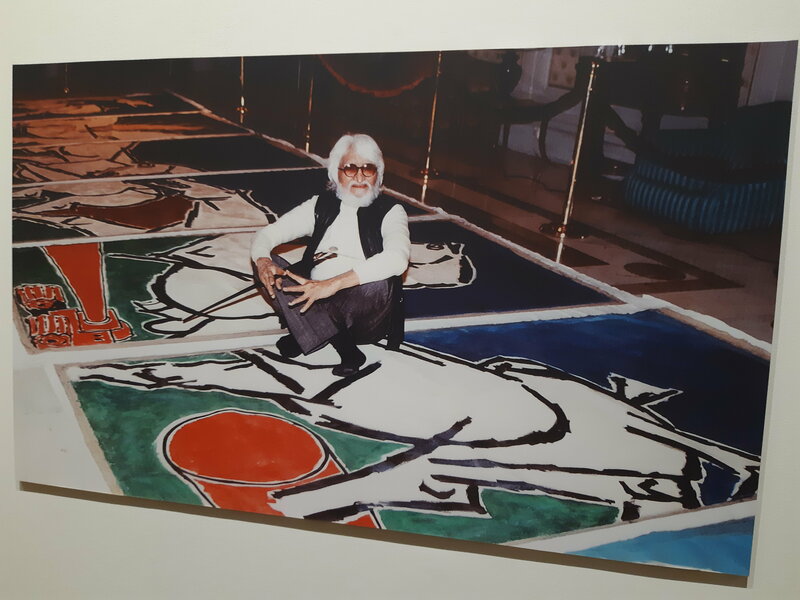 What prompted you to collect M F Husain’s works? What was it about his art that fascinated you? In the early 90’s as I was collecting miniatures, I came across the works of the progressives, and particularly M F Husain. My first work was of the artist, because the artwork communicated with me and it really resonated with me. Needless to say, that I collected all the progressives works, including Tyeb Mehta, Akbar Padamsee, F N Souza, Bal Chhabda, VS Gaitonde Ram Kumar and Krishen Khanna. Many consider Husain a rebel in the art world. How do you remember him? I am not sure if you can label him as a rebel in the art world. What I can say is from my own experience that he was a marketing genius. He knew how to market himself and create a hype in everything he did. He was always in the news regardless of being a good or bad media. He was always on the cutting edge. There are many similarities between Picasso and Husain, as he was called in by many newspapers and media as the “Picasso of India.” He was the master of his creation, and due to that ability, he created art with passion and depth of his subject. He not only commanded but gravitated attention towards him from all the people who he came in contact with. M F Husain’s largest painting ‘Lightning’, from 1975, exhibited at the Asia Society through August 4, 2019. The owners of the painting, Marguerite and Kent Charugundla, at the reception at Asia Society, on March 19, 2019. Photo: Mohammed Jaffer-SnapsIndia. 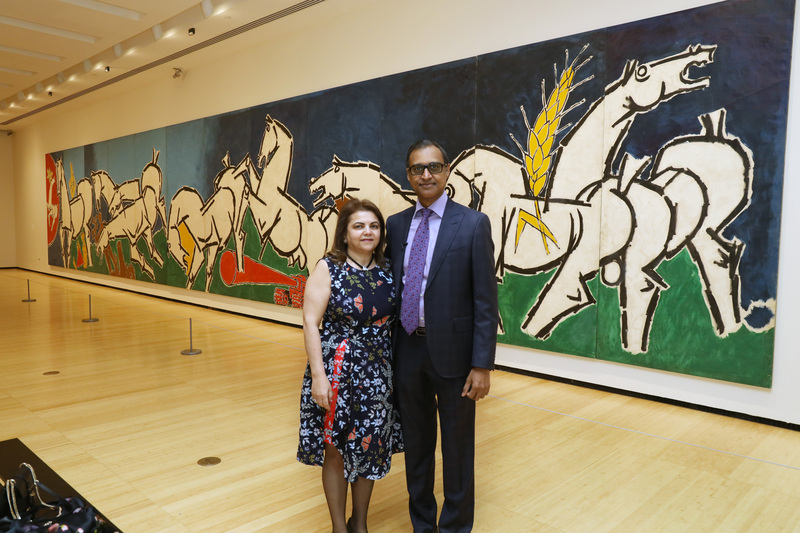 You bought Husain’s Lightning for $400,000, in 2002. Is there a price tag to it today or is it priceless? I bought Lightning because it was his signature horses painting. I was always fascinated by the movement of the horses, which project pure kinetic energy. At some point I was in search of the largest artwork that existed of M F Husain’s work. I always hoped that someday that the Lightning will be exhibited in a museum, so it is available for the viewing for the masses. The day has come for Lighting to be shown in its full glory. From my perspective it’s priceless. Will you ever part with the piece? At this time, I am only thinking of showcasing the Lightning in the museum and would like to make it available as a traveling exhibition. I am very attached to this piece because of the way I acquired it from the artist. It became part of my past and an invaluable memory. We are simply custodians of the artworks and are trying to safeguard it for the future. I am blessed that I have this opportunity to own such a piece and continue to be an art connoisseur and collector. Over the last two decades, Indian art has had its ups and downs. How do you see modern and contemporary Indian art in the global market in the years ahead? You are absolutely right. Indian art has had its volatility in the past two decades. Not only Indian art, but also American, Chinese and European art. However, I believed that Indian art suffered the most because of the bubble that was created by many who were involved. When art doesn’t organically grow there is always a chance that it will get to the bottom line. Many of the contemporary artists suffered, because of this bubble and are having a great difficulty to bounce back to the market heights. Progressive artists on the other hand have already recovered and are appreciating more vigorously. Today’s market is very different from 2008. It is buyers’ market and the collectors decide which artwork should be at what price instead of the prices of the artwork being imposed on them by galleries and auction houses. Works of some modern and contemporary Chinese and European artists in comparison fetch far more at auctions. Is it a question of better marketing? Or what else do you attribute it to? Unlike Indian art, Chinese art has been collected by western collectors for over many decades. However, more recently the economical up-rise of China has resulted in a hunger by Chinese collectors to collect more artwork no matter what the price, in competition with the western collectors. Also, Indian population in general did not collect Indian art until the artworks were fetching highest prices. It became a competition between the collectors and the new riches. Who are some other Indian artists that you like to collect? Do you frequently change art on walls in your house, or like to keep them locked away till time for museums or auctions? I am primarily a Progressive artist collector and passionate about the art that was created immediately after India’s independence. The art that was created in that time period was the best because it was New art for the New India. Each artist in that group was expressing themselves in different media and different style. Some did abstract art others did Indian mythology, and few did figurative. Majority of my artwork is large in size. I have few of my artworks hanging on the walls of my residence. However, majority of them are in our storage space due to the size and volume. Now and then and as time permits, I change the art pieces on my walls. Our collection has been exhibited in several museums, including Queens Museum, Guggenheim Museum (New York and Venice), NYU, and at Asia society in two different exhibitions, most recently in Asia Society exhibition focused on Lightning which is on view until August 4, 2019. This exhibition was curated by Dr. Boon Hui-Tan, who as a non-Indian origin telling the story of Indian Progressives, is admirable. Boon Hui Tan has so much passion about Indian art and artists. He knew that India’s story should be told from the beginning of history. That is the reason why he decided for the Progressive Artists Group exhibition. To show the vigor and energy of artists during dawn of India’s Independence. What’s your take on some of the emerging artists in India? Do you scout for new works? Due to the market correction especially in Indian art since 2008, only the passionate artists are producing good works. The new generation of artists are trying to produce cutting edge art and are more aggressive creating experimental art and some are incorporation new technology. I always look for new talent, as such I buy when I find work that I love regardless of the artists popularity. What’s your advice for aspiring art collectors? As Indian art prices has gone up drastically, it is harder to make mistakes. As a new collector one has to learn from others’ mistakes, because stakes are much higher than before. My suggestion would be that, as a new collector you should learn more about the artist, about the type of art you like, and how much you want to pay for that artwork. To learn about art, one has to visit galleries, museums, auction houses and develop an eye for what you like. After knowing what you like and which kind of artwork you want to collect and also studying the artist, you should follow the art closely to see what is happening in the auction houses, galleries and even in private sales and get a benchmark. Make sure that the artist is in mid-career and someone who is committed to art and is not looking to change their profession. Also know where they are exhibiting, whether they are national or international artists. What kind of art they are producing. Is there progression of their artwork? As a new collector, I would also suggest that you buy the best art that you can afford. If money is no object, start with the Progressives and then work your way to the contemporary. Most importantly educate yourself on the genre you wish to collect and buy what you love.